I decided to return the jacket I reviewed here. The jacket was nice but it wasn't special enough for me to keep. These earrings were the only purchase I made for the month of September. I adore them! They're very unique and different than my every day studs. I get compliments every time I wear them. This was my first time order from Rue Gembon and I am impressed. My order arrived within a week (they're located in Hong Kong). 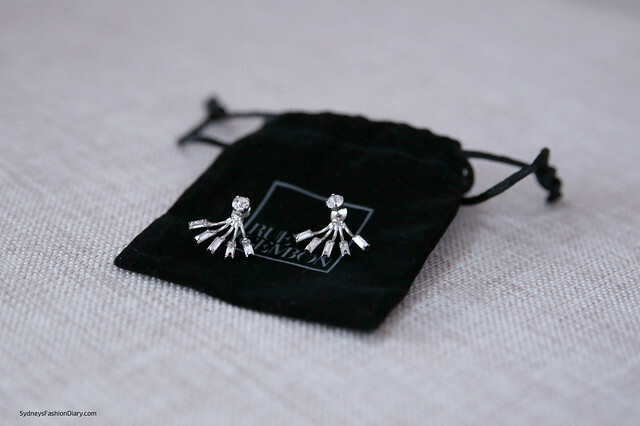 These earrings look very nice in person and definitely catch the attention. If you're looking for a pair of studs with a twist, I highly recommend you try them out. Shop their entire ear jackets here. I love how they fan out. I would have never considered this style until now. Thanks! Amazing earring and love your glasses!